Renault have announced that their drivers will remain the same for next season. This was largely as expected for Fernando Alonso, whose options became very limited after Ferrari and BMW confirmed their teams for 2009, the only surprise being that Alonso has signed for two more years. Many suggested that he would stay for a year and then hope to get a Ferrari drive in 2010 but Fernando's view is probably more realistic; the Scuderia is happy with Raikkonen and Massa and the Finn is contracted until 2011 anyway. 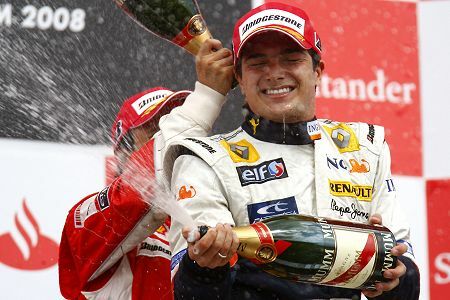 The big question has been answered, however: Nelson Piquet Jr survives to put his first year's experience to better use next season. That shows commendable good sense on the part of Flavio Briatore and leaves Lucas di Grassi hoping that Honda see fit to put him in Barrichello's seat for 2009. It seems a little unlikely to me, given the ambition of the Japanese team, and I think Rubens can start breathing a little easier now. Nelsinho has been most people's pick of rookie most likely to be dumped all year and his results, apart from a lucky second in Germany, have been unimpressive, to say the least. He did improve as the season wore on, however, and was getting close to Alonso's lap times towards the end. Whether that will be enough to justify his retention remains to be seen and he must work hard to ensure that he spends much less time off the circuit in future. He must be grateful, too, that competition for his seat has not been intense. Although Renault has been interested in di Grassi and Romain Grosjean, their track records are not suggestive of any lurking and undiscovered talent. The likelihood is that, given the chance, they would go through the same learning (and humbling) process that Piquet has already experienced and the team would have to continue as effectively a one-car effort. To give Piquet his due, he has had a difficult role to play. With Alonso returning to the team as the bright hope for the future, it was always clear that Piquet would be very much the number two driver only. The extent to which this was true was evidenced by Briatore's rather shame-faced admission mid-season that he would be giving Nelson a bit more support for a few races; the inference was that Piquet had been left to sink or swim until then and it is no surprise that his results were so poor to begin with. From that time onwards, Piquet improved greatly and began to provide more credible back-up to his team mate's efforts. Alonso's dismissal of Nelson's second place in Germany as luck was indicative of how much more of a threat Piquet was becoming. Fernando really does not like to be beaten by his team mate! Nelson's ignominious exit from the last race of the season must have come close to wiping out the memory of his improvement, however, and it may well have been a very close thing as to who won the seat for next year. I have no doubt that it was his experience that swung the balance in the end and Nelson is going to have to put in some very strong performances in 2009 to satisfy his boss that he made the right decision. After all, it is not unknown for a driver to be substituted halfway through the year. Curiously, I think he will manage it. Although he is never going to beat Alonso consistently, he showed considerable talent in some of the races this season and is beginning to curb his wilder instincts. This time, too, we see none of the braggadocio that made him appear arrogant before his 2008 debut. He seems to have learned his lesson and may have a more realistic view of his abilities now. So I am glad that he is getting another chance and I hope he does well. It is the right decision for the team from the stability aspect and I can see no available drivers that would be likely to do a better job. Good luck to Nelsinho. Jesus, how much did you write just to try to escape to say something good about what Alonso has done with a tractor this year...... That's the main point and your evasion was amazing!!! Why Nelsinho wasn't given a bit of support can't be a mistery to you. I'll ask you a question: You have two drivers in your time, a crappy car and a budget to spend on engineering and development. One of the drivers is a rookie with no experience under pressure and abilities yet to discover. The second one has won two WDC-WCC with you. So What driver would you pay attention to develope your car? How much support would be enough to reach the objectives? What's your main card in this game? O.K. We already know that you don't like Fred so I'll answer for you.... Nelsinho, f course. Roger: My, my, such passion! Actually, all season long I have been pointing at the brilliant job Alonso has done in the Renault, even when others were blaming him for the car's lack of performance. The reasons for not saying too much about him in this post are that I don't like repeating myself and that the real surprise of Renault's line-up was Piquet staying. That makes Piquet the main point of interest and the matter of why Renault concentrated on Alonso this season is so obvious as to be old news. I mentioned the team's neglect of Piquet in the first half of the season merely to illustrate how difficult it had been for him, not to criticize Renault's policy. You are even wrong about my feelings on Alonso; he is not my favourite driver but I would never deny that his driving skills are excellent. Ok, I'll leave passion on my wardrobe. But, don't you think the principal question today is what we should expect from this agreement? I've been told everywhere that what Alonso should do is stay at Renault and make a Schumi, bringing back the golden era. I've heard alround that it would be incredible if he could get a car to join the battle for the championship. There's a poll in Autosport's forum and he is almost tied with Lewis as the best driver of the year..... Man. Your post is something like making and allelluyah because Heikki did retain his seat the day after that thrilling final race that made Lewis champion. If you have heard it everywhere, Roger, that is reason enough for me not to touch it. I try to discuss the things that are not being noticed in F1 or at least view them from a different angle. After all, if you can read the same thing on ten other sites, why would you bother to visit mine? As it happens, I have been busy elsewhere today and not seen it suggested that Alonso could build the Renault team as Schumacher did with Ferrari, but it did cross my mind that it might be the reason for him signing for two years. It is speculation, of course, but I am not afraid of that on occasion. And Fernando is the driver best placed to make such a thing work at the moment - he has the experience, the charisma and intelligence to succeed. And I do rate him as the only driver who can compete with Hamilton at present. If the only alternatives are di Grassi and Romain Grosjean then I understand why they stay with Nelsinho. But there are other alternatives, a frenchman, Serbastien Bordais. If you say the skills are equal between these two, then a french team should prefer a french driver, I think. His F1 rookie year is also over like Nelsinho and I will rate him much higher than him. I know they say he is to old, but I think the reason is, he will be to difficult for Alonso to handle. They(Alonso) want a number 2 driver, not a competitor. I agree, Hezla - Bourdais should have been a good option for Piquet's seat. The problem may not have been age at all, however (I think that was just an excuse for Renault not looking at the only French driver in F1 at the moment. Before Bourdais went to America, he had a test with Renault and they were interested. But the deal came with Flavio Briatore being Sebastien's manager and Le Seb just didn't want him in that position. And there went any chance of Bourdais driving for Renault as long as the Flav ran the show. What I really do not understand is why Honda don't make Bourdais an offer. It's obvious that they would like to get a younger driver into Barrichello's seat but seem resigned to another year with him, now that Alonso has opted to remain with Renault. In my opinion, Bourdais is the hottest property still available for F1 at the moment and STR need their backsides kicking for not confirming him for 2009 yet, Honda need a wake-up call to take a close look at him.